Inspired by evening garden weddings and modern aesthetic, we are swooning over our latest DIY project that was meant for summer romance! 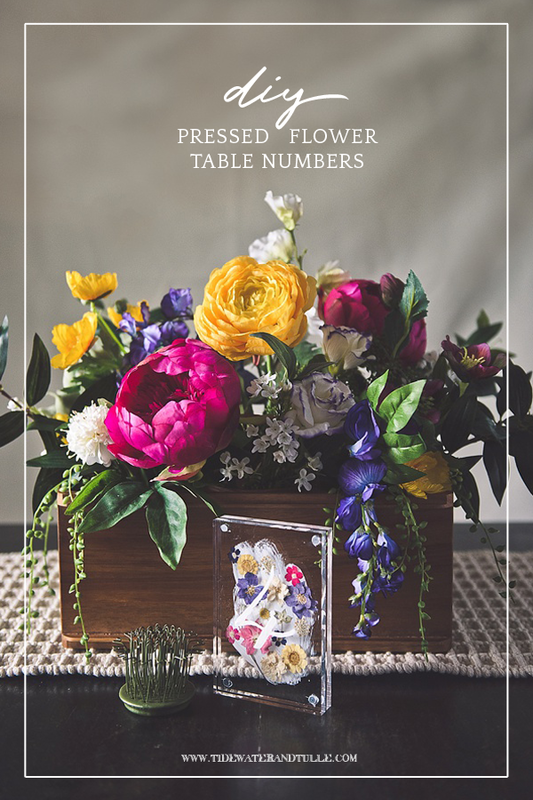 With trendy acrylic and delicate dried flowers, we have envisioned a beautiful way to let guests know which reception table is which. Not only is it super easy to make, it also doubles as an upcycled gift after the wedding that you'll discover below. 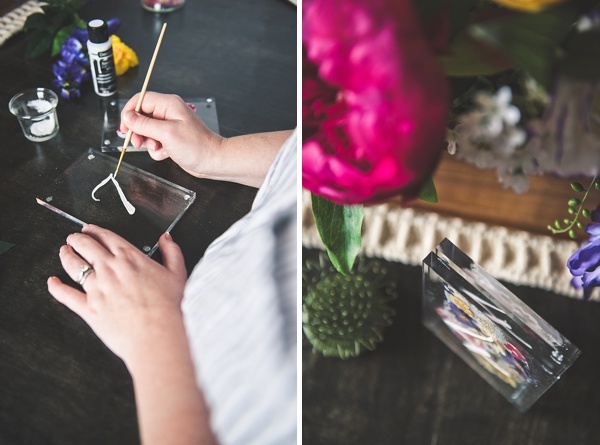 So grab your paintbrushes, and let's get our crafternoon on! 2. We'll first make the flower background. Using your white paint as an adhesive, dab some of the paint on your thick bristled brush and make three strokes across your acrylic surface. QUICK PAINTING TIP: If you're new to getting creative with paint, make a long stroke in the middle and then a short stroke on each side of it. If you'd like to add more or extend one of your stroke lines, do what looks best to you! 3. 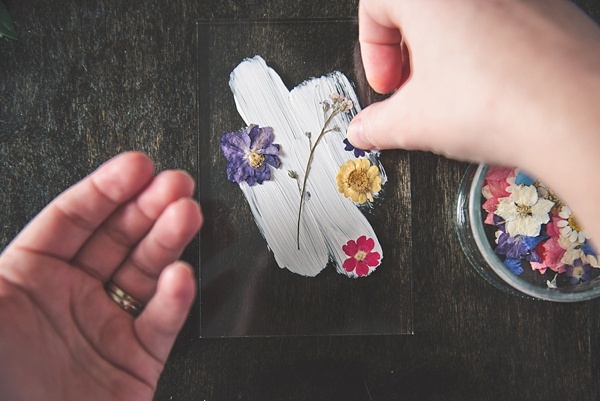 Before your paint dries, arrange your dried flowers on your paint strokes and gently press. 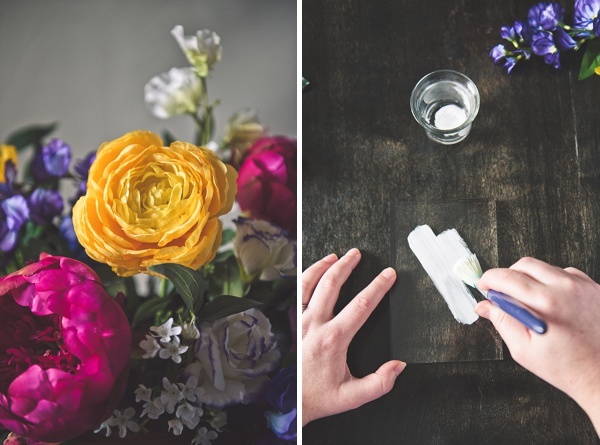 Consider balancing out shapes and colors of your flowers for your background, but leave some of your white paint showing. Allow to dry. 4. With the strong craft glue, put a tiny glue dot in each corner and place a magnet on top of each. 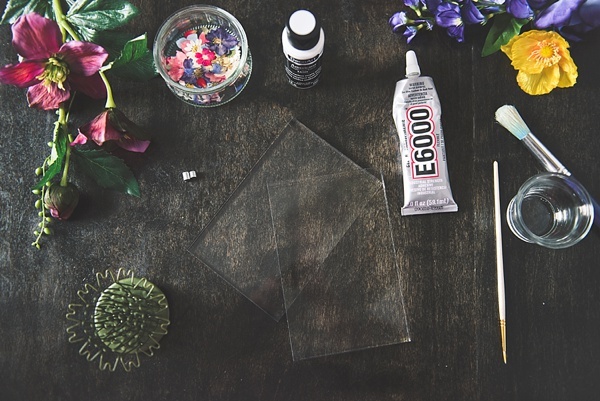 QUICK TIP: If you get "strings" from the glue on your acrylic block, take a cotton swab and some nail polish remover to swipe away. You may also want to "trim" some of the glue around your magnet, and the nail polish remover will take care of that as well. Easy fix! 5. 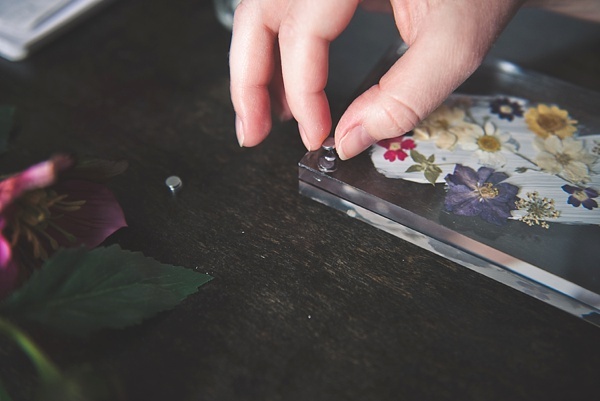 To line up your magnets properly, take your blank acrylic block and place on top of your flower background block. Put parallel glue dots and magnets in each corner so they match up. Because this blank block will be where you'll paint your table number, allow to dry for at least 15 minutes before painting so the magnets don't slip or move out of place. 6. Once the magnets are relatively dry, flip over the block so the magnets are the bottom. 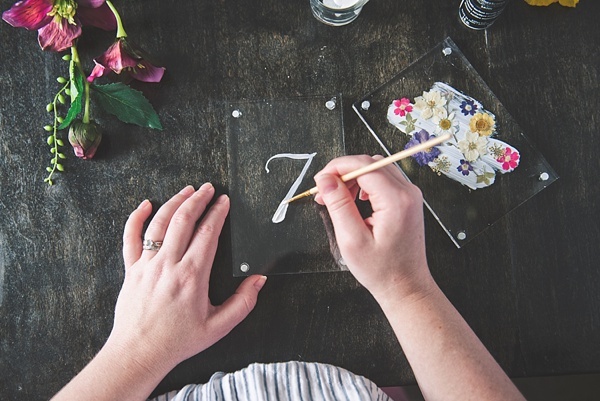 For your table numbers, decide whether you want to freehand your numbers or if you'd like to print off a font from your computer and then trace on your acrylic block. Choose what's best for you! 7. 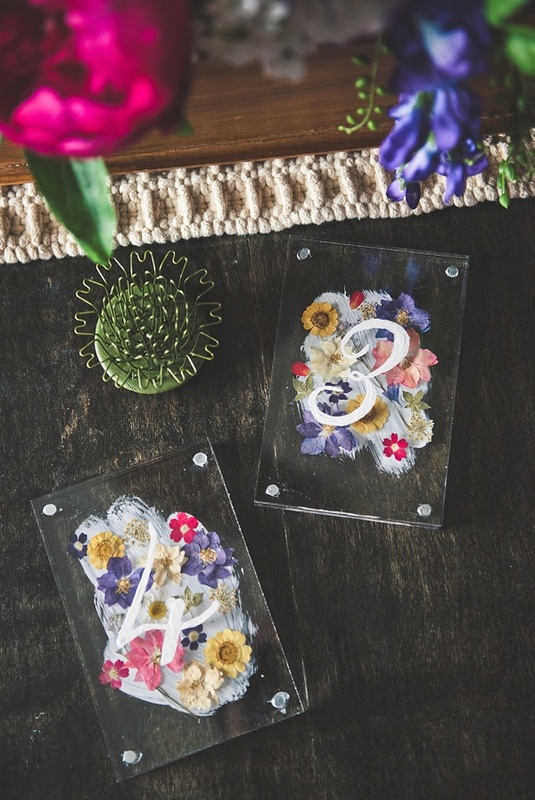 Paint your table number on the acrylic block so it would be on top with the magnets on the bottom (or you'll have a backwards number!). For a more opaque look for your table number, let your paint dry before adding on more paint layers. 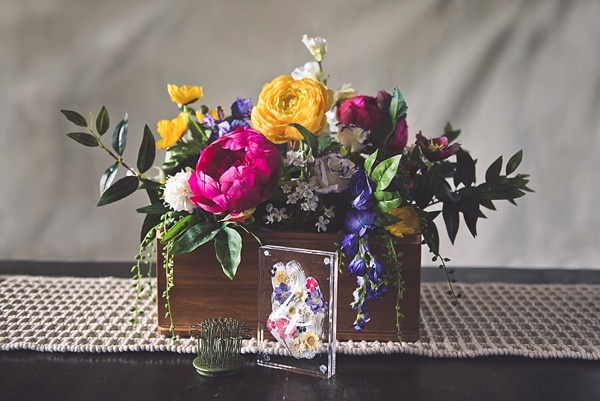 We love a bright white look against the colorful pressed flowers! 8. 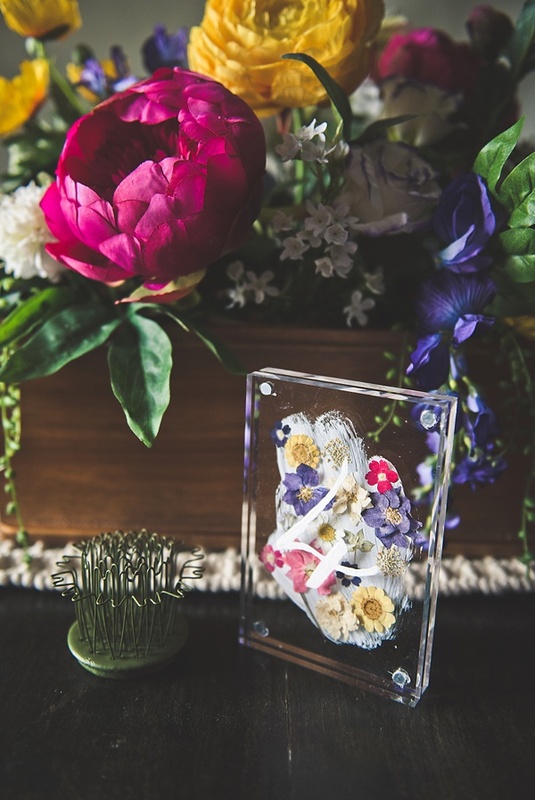 After your paint and glue have completely dried, connect your two acrylic blocks and admire your handiwork! What do you do with all of your table numbers after the big day? We're pretty passionate about upcycling, and this project is no exception! 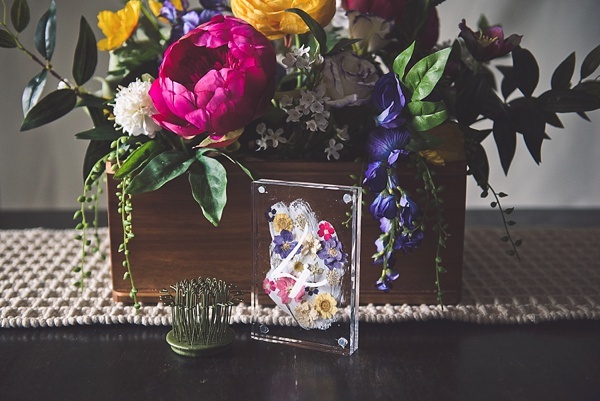 These acrylic blocks double as beautiful photo frames. Since you'll have quite a few, gift some to family and friends once you receive your professional wedding photos! 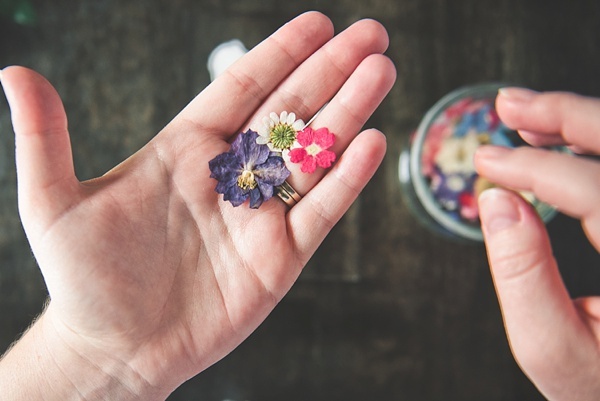 To clean and prep, peel off your pressed flowers by hand. Avoid using a scraper that could leave scratches behind on the acrylic. Moisten a paper towel with nail polish remover to take off the white paint until clear again. There will be a gap between the acrylic blocks since it was made for flowers and not photo paper. If you want a smaller photo for the 4"x6" block frame, use small pieces of double-sided tape on the back of your photo. Need Some Table Setting Inspo?